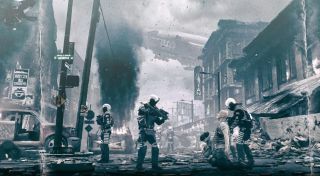 The most obvious question about Homefront: The Revolution, at least within the context of its fiction, is how North Korea managed to successfully invade and occupy the United States of America—far and away the world's foremost military power. A new promotional trailer for the villainous-behind-the-smile Apex Corporation helps shine a bit of light on that in a trailer that tells its history, and then leads to other, more interesting places. “Uncover the truth,” the faux-break-in blurb at the end of the trailer says, under the header “Liberty 7,” and just above a link to tiny.cc/apexhistory. It's not quite as unexpected and mysterious as it first appears, because the link, with the full URL, is also included in the YouTube description. But the absence of actual intrigue notwithstanding, the site does provide some interesting tidbits of info from the end of the Korean war in 1953 to the game's alt-future in the year 2029. Real-world historical events, like the Vietnam War and the Kennedy assassination, are interspersed with fictional elements—increasingly so, as the years progress—and it all has a subtle, fun, pro-DPRK vibe, backed up by images, videos, and audio clips. As supporting material goes, it's really well done, and while some holes remain to be filled, it does a reasonably good job of rationalizing the fiction of a North Korean takeover of the US—good enough to justify a videogame war, at least. Homefront: The Revolution comes out on May 17.